August 1845, Timothy Wilde’s career as a barman in lower Manhattan is ended by a fire that decimates a district. A couple of days later his politically connected brother, Valentine, secures him a post in the newly formed city police department. Wilde is a reluctant police officer in a town that is teeming with crime and poverty, made worse by thousands of penniless Irish arriving to escape the great potato famine. But he’s also a very good detective and when a young girl who is covered in blood crashes into his legs he sets about investigating her story. What he discovers threatens the future of the force and to bring tensions in the city to boiling point. 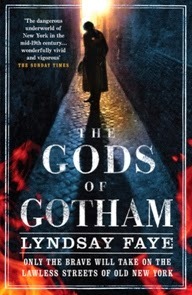 The Gods of Gotham hits all the buttons for a successful debut novel -- colourful characters, engaging prose, a strong sense of place and time, historical interest and detail, authentic dialogue, and a page turning plot. Faye drops the reader into mid-nineteenth century New York and its urban fabric, social life and tensions, squalor, and political shenanigans, building the story around real events that took place in the city at the time. This world she populates with a range of well-penned characters, who speak using slang used at the time and published in George Matsell’s (the first chief of police of New York) The Secret Language of Crime published in 1859. The tale is well plotted with plenty of intrigue, feints, and twists and turns. The prose is lively and expressive and evocative. Despite all the positives there are couple of detractions: at times scenes are over written, with the prose style and twists becoming a little overbearing and wearing as the story unfolded; and occassionally the details and research are writ large, when they either weren't needed or should have been more contextual than front and centre. Nonetheless, The Gods of Gotham is an interesting, entertaining and engaging read.